Zadnja stvar, ki sem jo objavila, je bila verjetno že dobrega pol leta nazaj. Za nekaj časa sem poniknila. V želji, da dokončam študij. Preblizu koncu sem bila, da bi odnehala, vendar kar nisem mogla videti tiste luči na koncu tunela. ”Res ne bo lahko, ampak na koncu ti bo uspelo!” so bile besede prijatelja, ki so mi le vlile nekaj upanja. 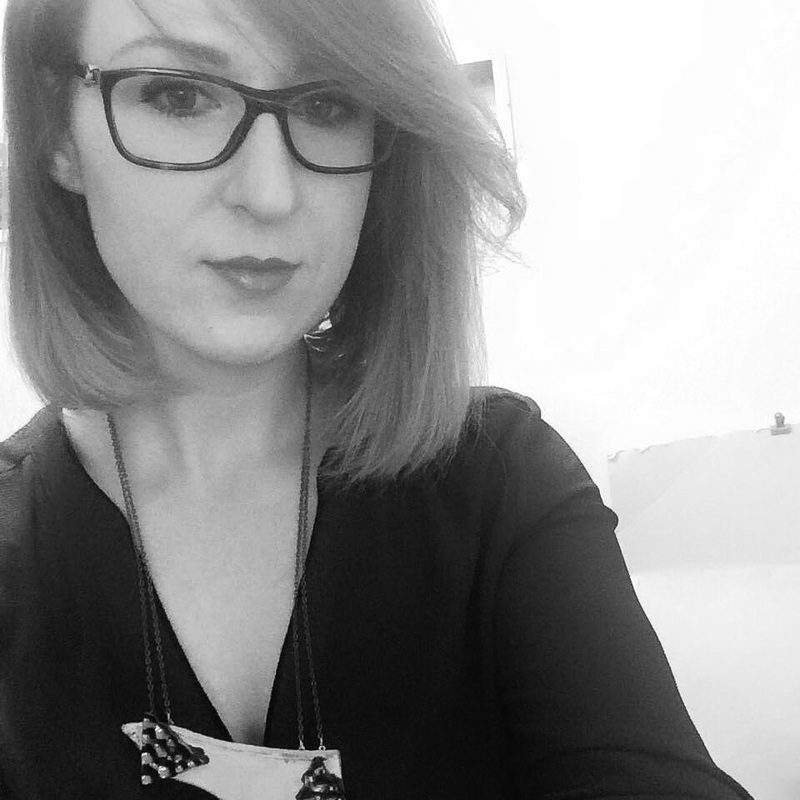 In tako sem se odpovedala svojim hobijem, predvsem pisanju in fotografiranju, po nesreči zabredla novim hobijem naproti, in zaključila obe diplomi. Bila sem srečna. Breme, ki sem ga leta in leta nosila, je naposled izginilo. A ostal je grenak priokus. Priokus po izgubljenem času. Zima se je sprevrgla v pomlad, pomlad v poletje, poletje v jesen. Nenadoma je izginil vsak spomin na vse, kar se je pripetilo v tem času. Prazna, brez vsakršnega občutka, izgubljena. Ko sem pred dnevi hodila po ulici, sem spoznala, da so drevesa povsem gola. Zazrta v sivo megleno nebo, sem pod nogami čutila mehko in toplo listnato preprogo. Globoko sem vdihnila. Zima. Tisti poseben trenutek, ko si rečeš: ”Voham zimo.” In končno sem začutila, da sem jaz spet jaz. Pečico ogrejemo na 220ºC. Operemo, olupimo in zrežemo na večje kose sladek krompir, bučo in šalotke. Pokapljamo z oljem in posolimo. Pečemo v pečici, dokler ni zelenjava povsem zmehčana (približno 40 min). Pečeno zelenjavo skupaj z mlekom in smetano zmešamo v blenderju. Po potrebi dodamo vodo ali jušno osnovo (odvisno od gostote, ki jo želimo – meni je všeč bolj gosta juha). Prelijemo v kozico in na štedilniku med mešanjem segrejemo. Dodamo muškatni orešček, sveže mleti poper in po potrebi sol. Med tem narežemo tofu in gobice. V dveh ponzicah segrejemo olje. V eni prepražimo tofu. V drugi gobice, ki jim dodamo mali česna, posolimo in malo popopramo. Segrejemo vodo in skuhamo ajdove testenine. Na juho naložimo testenine, pražene gobice in tofu. Posujemo z nasekljanim petršiljem in zdrobljenim rdečim poprom. Svetlo, modro nebo. Rdeče, oranžno, rumeno. Hladen vetrič v vrtincu nosi padlo listje. Mir. In občutek neskončne svobode. Daleč stran od tega sveta. To jesen doživljam drugače. Občutek imam, de je nikoli nisem videla v takšnih barvah. Ali pa samo nisem gledala… Svetloba, vonji, zadnji sadeži narave, preden jo pobeli sneg in topla, močna, barvita hrana. Buče, velike, oranžne, rumene in grozdne jagode. Barve zemlje in barve neba. Bučo (hokaido/muškatno/butternut) narežemo na večje kose. Odstranimo semena. Posolimo in pokapljamo z oljem. Pečemo na 200°C, dokler se buča povsem ne zmehča (30 – 40 min). Bučo ohladimo in odstranimo kožice. S paličnim mešalnikom piriramo v gladek bučni pire. Pripravimo kvas: zmešamo 20 g svežega kvasa, 50 ml mleka in žličko agavinega sirupa. Pustimo, da podvoji volumen. V posodi zmešamo moko in sol. Dodamo kvas in 300 g bučnega pireja. Sestavine povežemo s kuhalnico in pregnetemo. Postopoma dodamo 6 žlic bučnega olja. Sestavine se morajo povezati, testo ne sme biti čvrsto, temveč zelo mehko. Pustimo vzhajati, da podvoji volumen. Ko je testo vzhajalo, ga v posodi še enkrat pregnetemo ob dodajanju 4 žlic bučnega olja. Testo razdelimo na več manjših kosov. Z oljem namažemo papir za peko ali pekač. S konicami prstov raztegnemo testo po površini na debelino 1 cm in oblikujemo manjše pogačice. Okrasimo. Pustimo vzhajati, da podvojijo volumen. Pečico ogrejemo na 230°C. Za peko uporabimo pekač, ki ga predhodno ogrejemo v pečici. Pogačice pečemo 10 – 15 min na 230°C. Leaves changing their colors. The wonderful smell of trees, mushrooms and fallen leaves. Sun. And sunglasses on. Almost as if it was still summer. L’été indien they call it in Canada. The last sunny days before the fall strikes with its grayish mists. Tiramisu. One of my favorites. In line with the season. On a sunny terrace. Warm and spicy. And a glass of red vine to finish. The ultimate dessert for last warm days of fall. Where s’the catch? Pumpkin puree. It will give the tiramisu lovely warm color and flavor. Plus, since my recipe is without egg it will bind the whole thing, add a hint of sweetness and help to reduce fat content. And the ultimate ingredient? Cognac. To give it a punch. And a lovely caramel flavor. Preheat owen at 180ºc. Cut pumpkin and remove seeds. Grease the pan with coconut oil. Sprinkle with salt. Slow roast until softened, between 40 – 60 mins (depends on the size). Cool the pumpkin, remove the skins and puree using a hand blender. Make some strong espresso. Set aside and let cool. Mix mascarpone (and ricotta, if using), pumpkin puree, espresso, rum and cognac as follows. Sweeten according to taste. The best is to make individual portions: layer of cookies, than layer of cream (making at least two layers of each). Let cool in the fridge for couple of hours. Sprinkle with bitter cocoa powder just before serving. Morning. Opened window. Rain drops. Light breeze. Air filled with oxygen. Deep blue sky with a hint of grayish mist. Freshly washed green leaves. Silence. Happy. And calm. I get up and walk to the kitchen. Barefoot. I like that feeling. It’s slightly cold in the apartment. Coffee. I like the smell of the coffee in the morning. It warms up the house. Fall is coming. I can feel it in the air. Colors are changing. And so is food. I want something to warm me up. I think of cinnamon rolls I had when I was in Sweeden. Nothing better to warm your heart up during those cold winter days. And I want colors. It’s pumpkin season. Sweet orange hokkaido works perfectly with cinnamon. And there are plenty in my mom’s garden. To start a day with something sweet is a must, but I never like to load up with sugar in the morning. I like to feel the earthly tastes of the food. Lightly sweet wholegrain bread cinnamon roll style is just perfect. To avoid adding sugar in the dough, I use hokkaido instead. It has dense flesh, but its taste depends largely on how it’s prepared. Roasting on a low temperature will bring out the sweetness and will give it an amazing caramel flavor. The dough will be sweet just enough. Traditional cinnamon filling is a mixture of butter, sugar and cinnamon. Use ground nuts and dates instead. If you’re not using bought pumpkin puree, cut and clean one medium size hokkaido pumpkin and oven roast until soft (aprox. 30-40 mins at 180ºc). Let cool, than, leaving the skins, place in a food processor and pulse until smooth. Mix warm milk with one teaspoon of sugar and dry yeast (do not overheat the milk since it can kill the yeast). Use coffee grinder to grind rolled oats in flour consistency. Mix with wholegrain flour. In a separate bowl mix pumpkin puree, agave syrup, softened butter or coconut oil and egg yolk. Add yeast mixture. Add pumpkin mixture to flour mixture. Stir with a wooden spoon until the dough comes together. Transfer the dough to a lightly floured surface. Knead the dough by adding enough flour so that it doesn’t stick to the surface. Form a ball and place in a floured bowl. Cover with tea towel and let rise in a warm place for about 30 mins. Repeat kneading once more and let rise for another 40 mins. Meanwhile prepare the filling. Roughly chop the dates and make a smooth paste using a mortar. Place in a saucepan with water and bring to simmer. Stir in ground nuts and cinnamon. Set aside and let cool. Place the dough on a lightly floured surface and roll to approx. 25×30 cm rectangle. Spread with even layer of filling and roll lengthwise. Follow the instructions above to form a wreath or slice the roll to create individual mini cinnamon rolls. Cover and let rise another 30 mins. * If you want the dough to be sweeter add some more agave syrup or the sweetener you’re using in the wet mixture. If you want sweeter filling you can always double the amount of ingredients used. * If you’re using sugar, you can sprinkle the wreath with icing sugar when completely cooled. 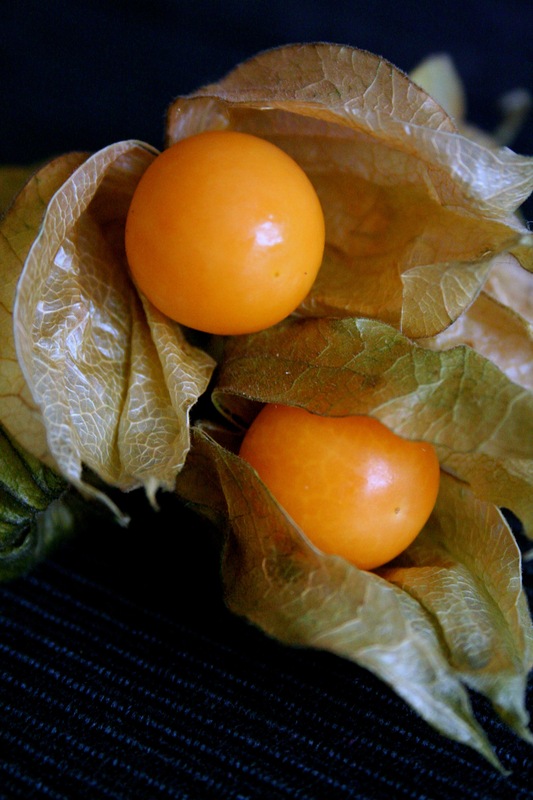 Physalis berries (Physalis Peruviana) can be found under many different names as cape gooseberry, inca berry, aztec berry, golden berry, giant ground cherry, peruvian cherry. 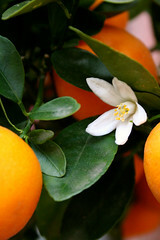 They are rich in vitamin C, essential amino acids, beta-carotene. They are packed with antioxidants and soluble fibre. They have a sweet taste with a sour finish. And thyme… it needs no words. It’s an amazing herb that goes well with sweet and sour, salty and spicy. 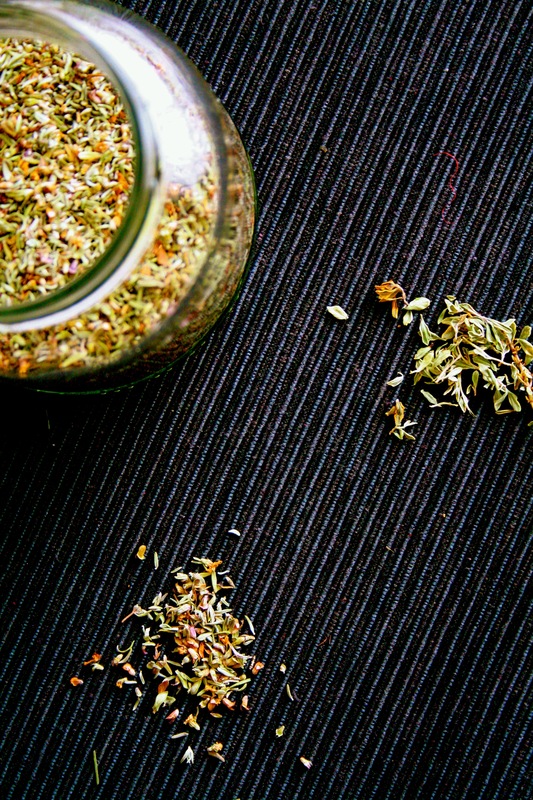 I especially like using lemon thyme that adds a hint of freshness to your dish. 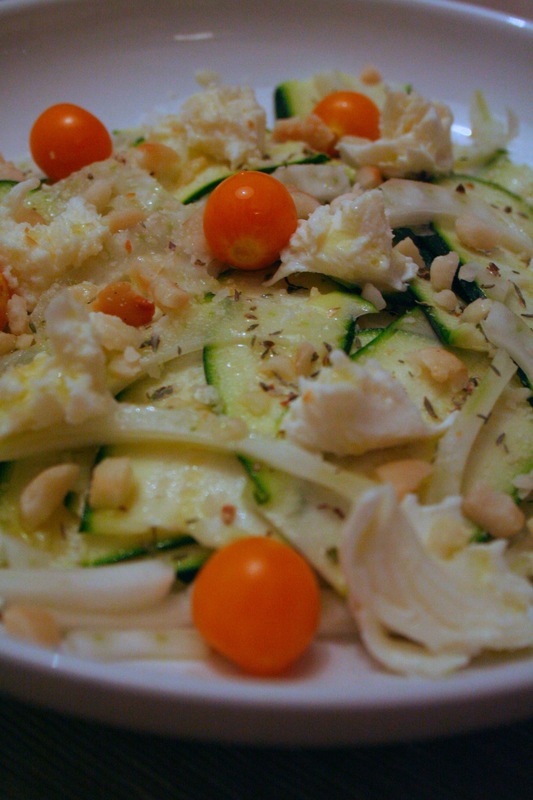 Make thin slices of zucchini using a peeler. 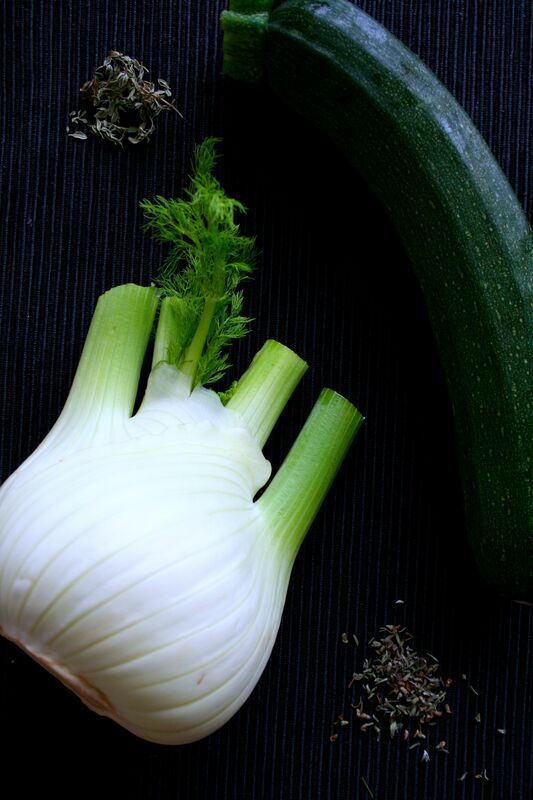 Cut fennel as thin as possible. Roast whole macadamias in an oven at 200*c for couple of minutes, just till they get light brown. Let aside to cool. Roughly chop or using a mortar and pestle crush in big pieces. 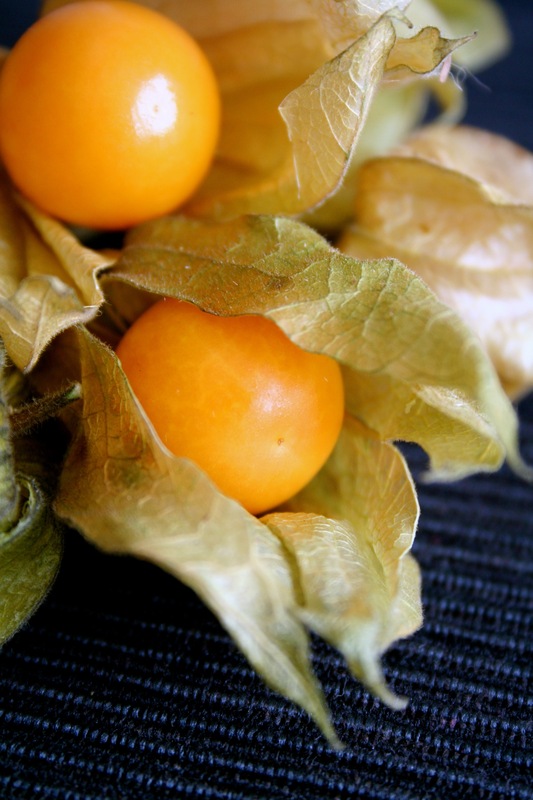 Rinse well physalis berries, you can also cut them in halfs. 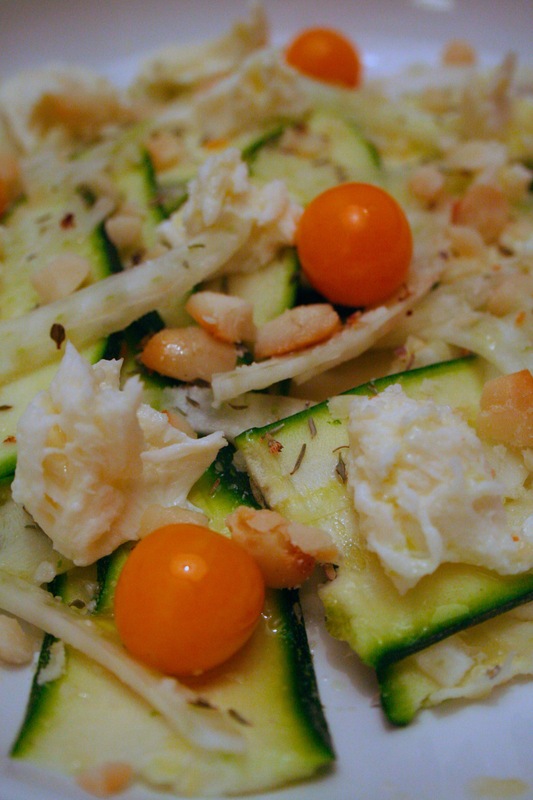 Compose salad by adding all listed ingredients, sprinkle with flour de del, thyme, olive oil and lemon juice. Če želiš slediti lolitabopa.com, vnesi svoj elektronski naslov in obvestila o dogajanju boš prejemal preko elektronske pošte.